Have you noticed 7th graders scurrying around audio and video equipment at school recitals, plays, and other performances? Find out who they are by reading the piece below by Thomas Flanagan, our long-time After School Music Program coordinator and guitar teacher. Last year, I approached Justine with the idea of starting a Middle School TPS production crew. With a green light, her best wishes, and the support of the MS teachers, things began to take shape. A few students who had shown great interest, as well as some experience in audio and video recording emerged from the 7th grade. From there, we formed our production crew. Since October, we have met weekly to discuss equipment, techniques, strategies for recording events, our hopes and dreams, and then the fun times began. Currently, our video crew is Sam Gualtieri (who created and edited the comedy https://vimeo.com/129736679)and Jalen Ramseur-Williams, who is always ready with a creative idea, energy, and enthusiasm. Our audio crew is made up of two wonderful young musicians, Arthur LaBan and Josh Zeelander, who you may recognize singing and playing guitar in our Earth Day video https://vimeo.com/125919868. 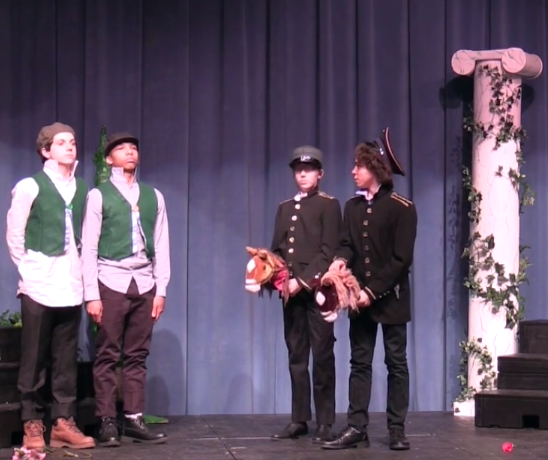 It has been our pleasure to record and document several artistic performances throughout the year, including a three-camera angle shoot of both 8th grade Shakespeare plays (Much Ado About Nothing https://vimeo.com/129140747 and The Tempest https://vimeo.com/124553626), the 3rd grade plays https://vimeo.com/129340494, the K-8 Winter Concert https://vimeo.com/129736680, and the Preschool/Kindergarten Winter Music Celebration https://vimeo.com/129736681.